Wash the potatoes and add them to the top shelf of a preheated grill. Let them cook (325 degrees) for about an hour or until cooked through. Remove the potatoes from the grill and cut them into bite sized pieces. 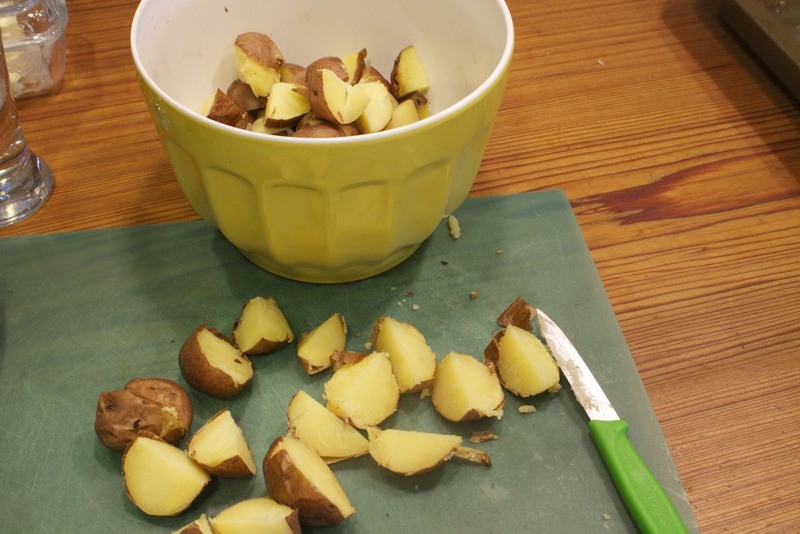 Depending on the size, you should get 4-6 pieces per potato. Put them in a bowl and drizzle with the champagne vinaigrette until all the potatoes are well coated. Add chopped fresh parsley and rosemary, then salt and pepper to taste. Posted in In The Kitchen and tagged with potato salad, potatoes, grill, champagne vinaigrette. April 22, 2013 by Lynn Adams.